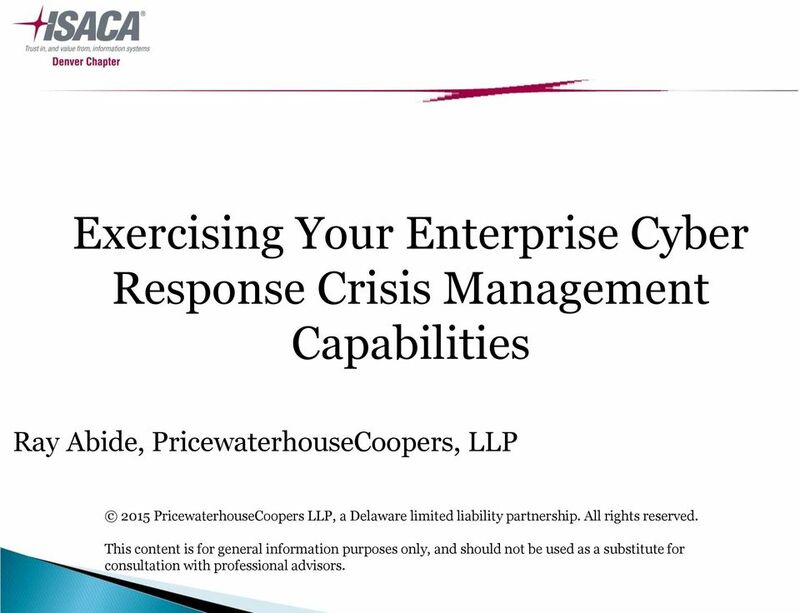 Download "Exercising Your Enterprise Cyber Response Crisis Management Capabilities"
1 Exercising Your Enterprise Cyber Response Crisis Management Capabilities Ray Abide, PricewaterhouseCoopers, LLP 2015 PricewaterhouseCoopers LLP, a Delaware limited liability partnership. All rights reserved. This content is for general information purposes only, and should not be used as a substitute for consultation with professional advisors. 3 CEO s view of cyber risks 69% of CEO s are concerned about IP/customer data protection, intellectual property protection, and cybersecurity. In some industry sectors, cyber risk threatens growth. 71% of US CEOs in banking and capital markets cite cybersecurity concerns. Companies are beginning to change how they think about cybersecurity viewing it as a business issue, not an IT one. Isn t it time that the crisis management program in its entirety be practiced to respond to these threats? 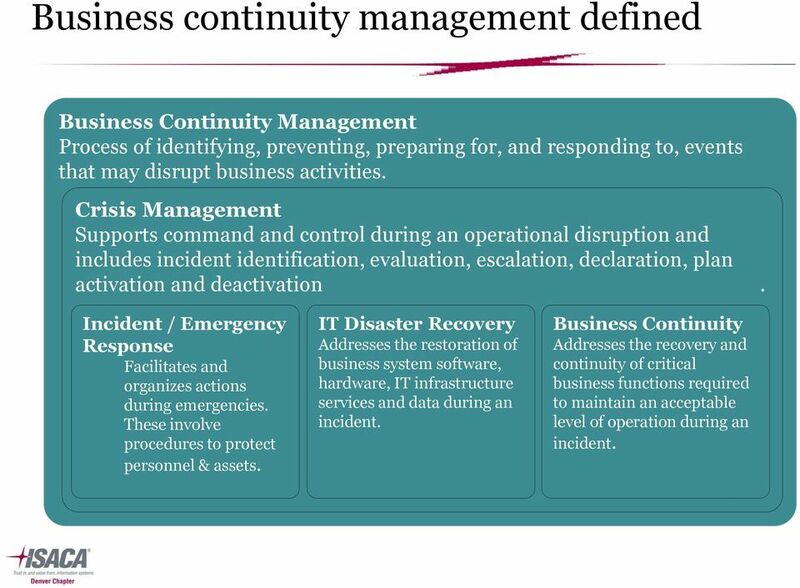 9 Business continuity management defined Business Continuity Management Process of identifying, preventing, preparing for, and responding to, events that may disrupt business activities. Crisis Management Supports command and control during an operational disruption and includes incident identification, evaluation, escalation, declaration, plan activation and deactivation with significant focus on crisis communication. Incident / Emergency Response Facilitates and organizes actions during emergencies. These involve procedures to protect personnel & assets. IT Disaster Recovery Addresses the restoration of business system software, hardware, IT infrastructure services and data during an incident. Business Continuity Addresses the recovery and continuity of critical business functions required to maintain an acceptable level of operation during an incident. 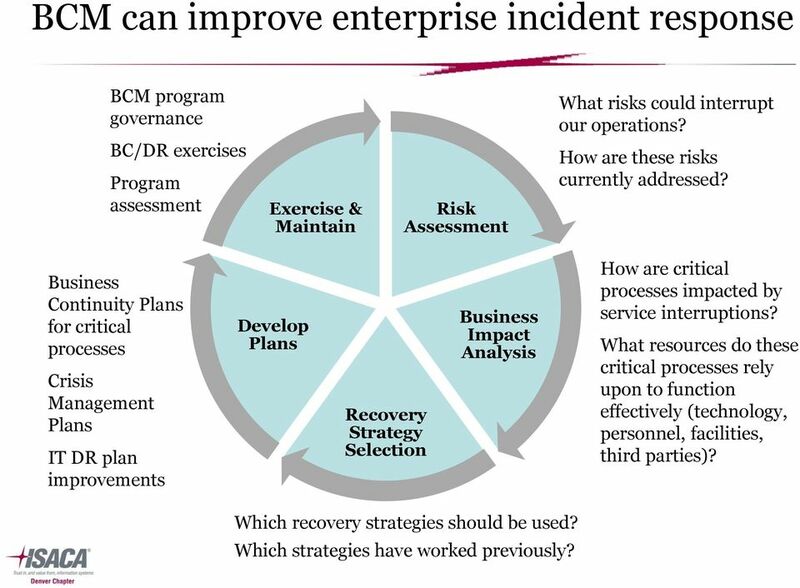 10 BCM can improve enterprise incident response BCM program governance BC/DR exercises Program assessment Exercise & Maintain Risk Assessment What risks could interrupt our operations? How are these risks currently addressed? 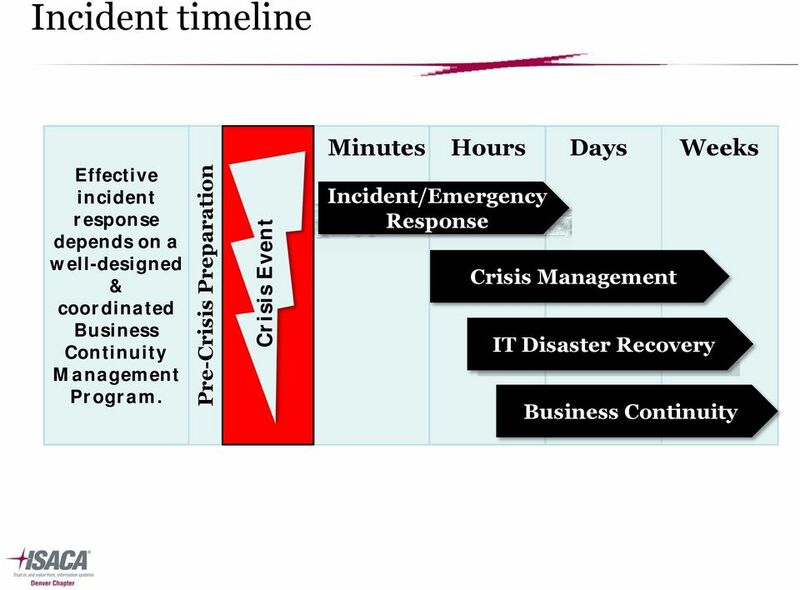 Business Continuity Plans for critical processes Crisis Management Plans IT DR plan improvements Develop Plans Recovery Strategy Selection Business Impact Analysis How are critical processes impacted by service interruptions? What resources do these critical processes rely upon to function effectively (technology, personnel, facilities, third parties)? Which recovery strategies should be used? Which strategies have worked previously? 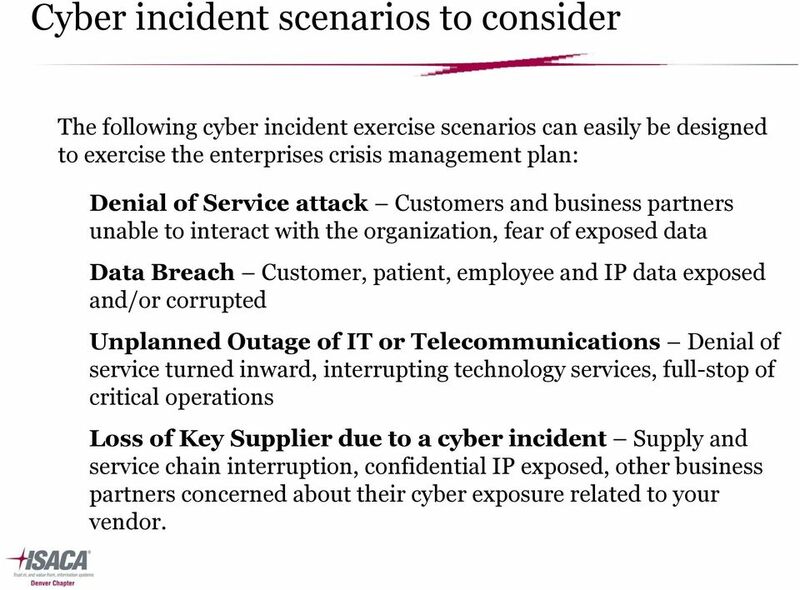 13 Cyber incident scenarios to consider The following cyber incident exercise scenarios can easily be designed to exercise the enterprises crisis management plan: Denial of Service attack Customers and business partners unable to interact with the organization, fear of exposed data Data Breach Customer, patient, employee and IP data exposed and/or corrupted Unplanned Outage of IT or Telecommunications Denial of service turned inward, interrupting technology services, full-stop of critical operations Loss of Key Supplier due to a cyber incident Supply and service chain interruption, confidential IP exposed, other business partners concerned about their cyber exposure related to your vendor. 16 Questions for management 1. Have you discussed cyber security risks with your audit committee? 2. Does your company have a comprehensive internal audit plan for your company s cyber security program? 3. 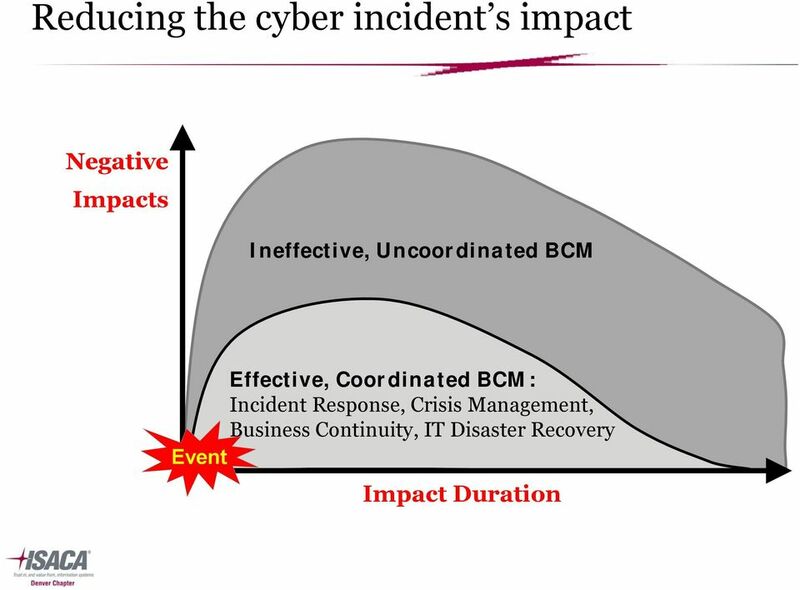 How well was your business continuity plan designed to respond to cyber incidents? 4. 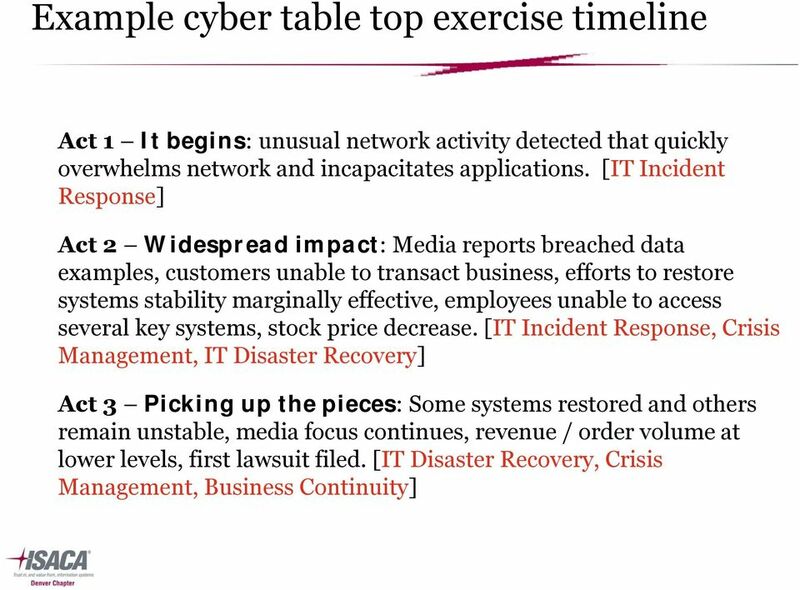 If cyber threats present a significant risk to the organization, has a crisis management table top exercise been conducted using a cyber incident scenario? 5. 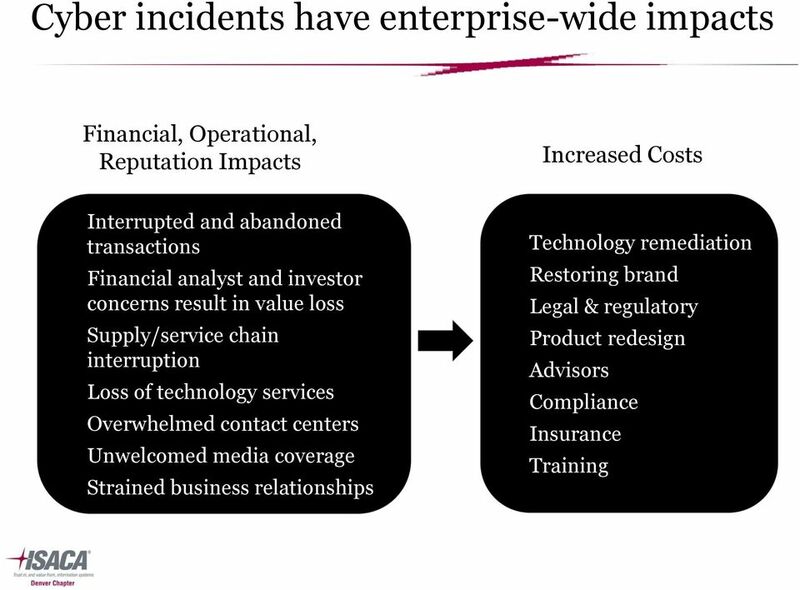 If a cyber incident response has been exercised, was the business impact analysis used to identify exercise participants based on interrupt impact? 6. 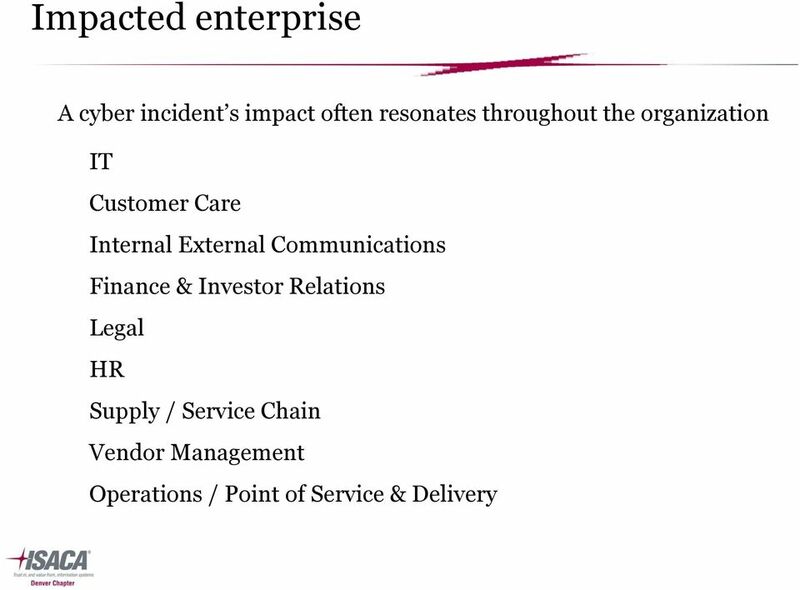 Has the organization determined how it will respond to one of their key vendors being impacted by a cyber incident resulting in their product / service interruption? 7. Does your company have a cyber security program and has your company assessed it using the federally issued preliminary cyber security framework? 8. 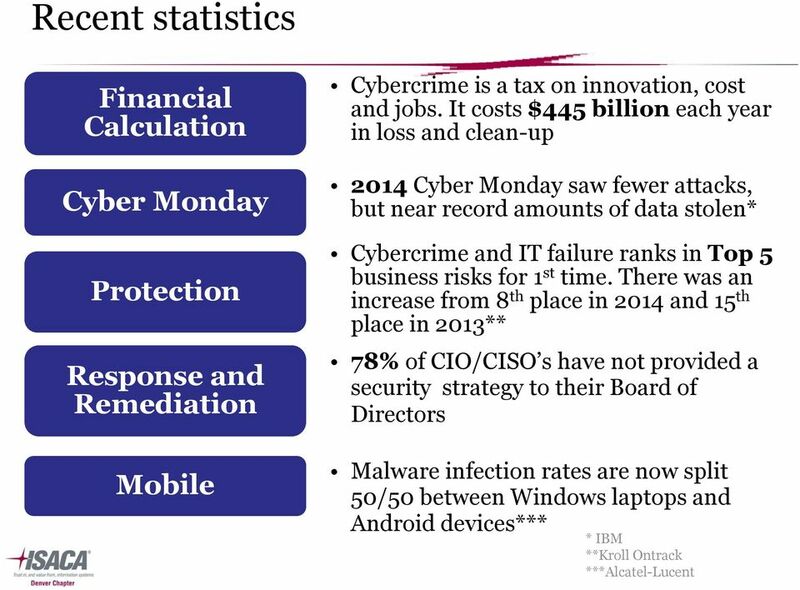 What company assets are most vulnerable to cyber attacks? 9. 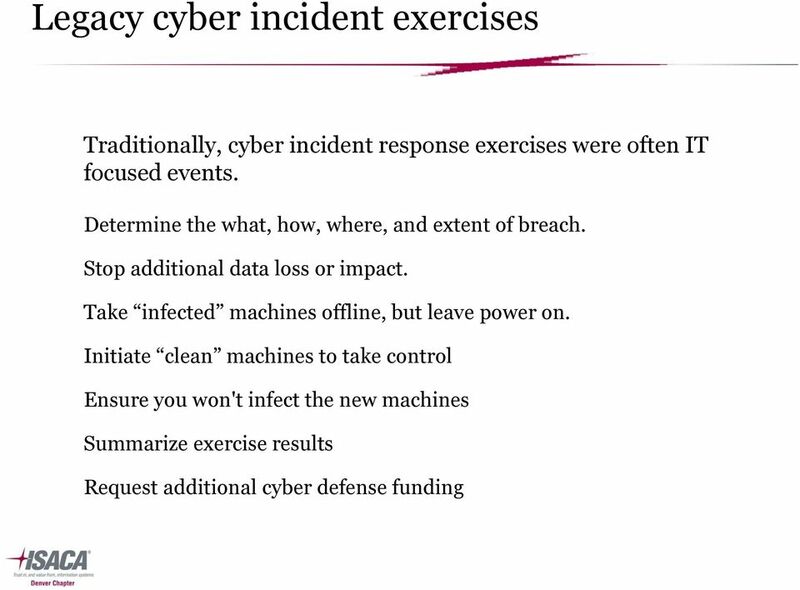 Does your company have an cyber incident response plan? And is that plan updated and tested periodically? DON T BE A VICTIM! IS YOUR ORGANIZATION PROTECTED FROM CYBERSECURITY THREATS? DON T BE A VICTIM! IS YOUR INVESTMENT PROGRAM PROTECTED FROM CYBERSECURITY THREATS? CYBERSECURITY: Is Your Business Ready?